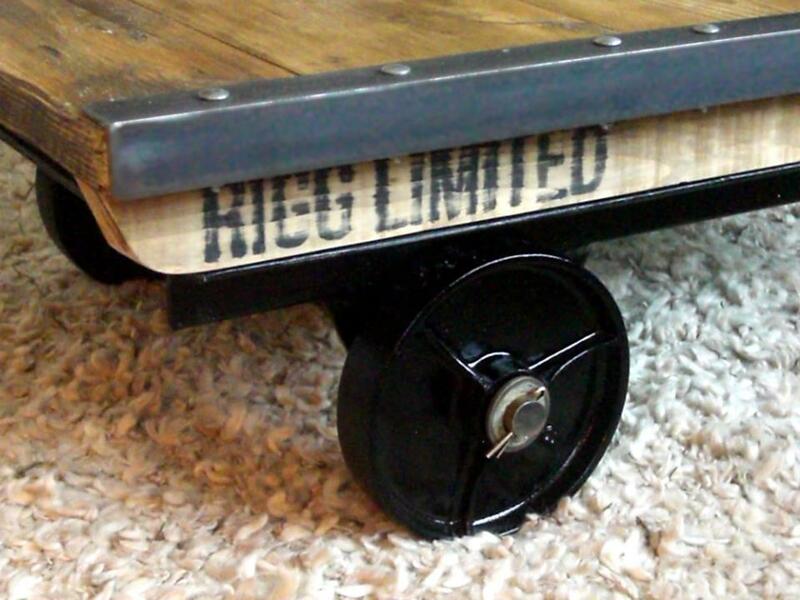 An original industrial factory cart coffee table refurbished to a high standard. One of a set of six we recovered from a field. We posted about them on our Facebook page in their original state. The photographs shown are of the specific coffee table you will be buying. At our Birmingham workshop, the frame for this super industrial factory cart coffee table was stripped, shot-blasted, rust treated and then coated generously in gloss black paint. 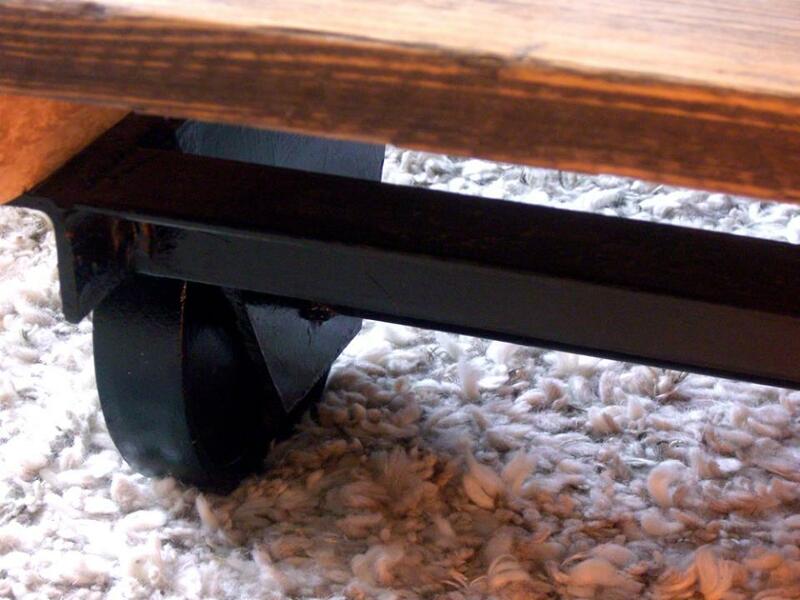 The heavy metal wheels were then refitted using fresh split-pins. The top is made from upcycled wood which has been sanded, sealed and hand-waxed to give a beautiful rich finish. Each one of the six carts has it's own quirks and differences, but they all look similar to the one pictured. Please note these are as a guide - contact us to confirm the size. These guide sizes are of the remaining 3 pieces. The item shown in the picture (now sold) is smaller than the dimensions. We are currently refurbishing the other larger 3 vintage industrial factory carts which accompanied this one. We can provide them in a darker finish if needed, along with custom stencilling at extra cost. The price below includes delivery to most mainland UK places. Made in Birmingham from high quality timber and steel. Many sizes and styles are available. 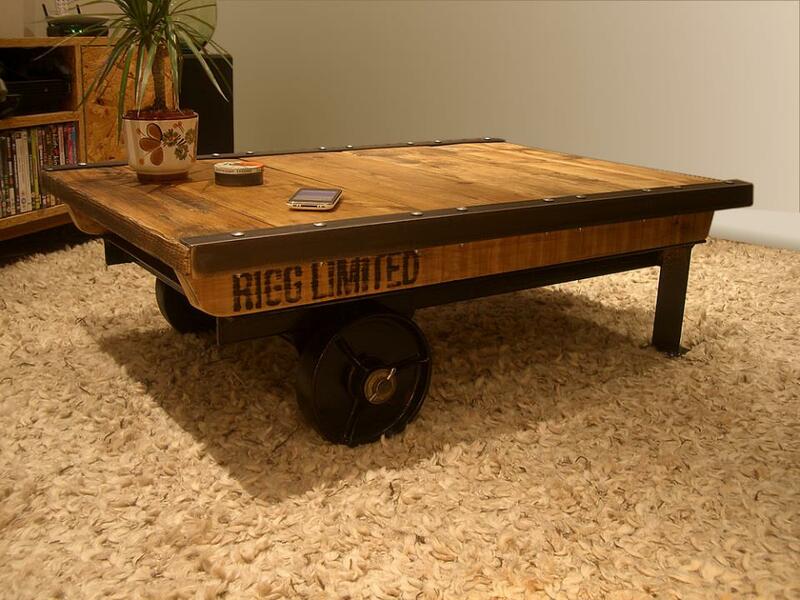 One of our vintage industrial coffee tables can really add that individual touch to a room. The hand-crafted products in this shop will add a touch of warmth and distinction to a space.